Husky WR125 for a beginner? By GerGa, August 22, 2017 in What motorcycle should I buy? So I have been motorcycling for 2 years. Young adult 5'7", 150lbs. Started with a DR650 which was a steep learning curve at first and admittedly too big for a new rider, but I was fine once I learned and rode many miles on road and dirt roads. It was too heavy even on road so after only a year, I sold it for a WR250R so that at least hitting some trails was doable. It came set up with gearing, exhaust, etc. Well it was good for several months of riding, but this summer I started a temporary break from road riding and put the knobbies back on for trail ridng only. Most of the local trails are technical and some tight singletrack where the 300lb dual sport with crappy suspension is not ideal, but at least I've learned to weight the rear with more throttle to make up for the excessively rebounding shock. Picture of my bike. I want to have more fun so am looking for a dirt bike now, anything lighter is sure to be more fun. 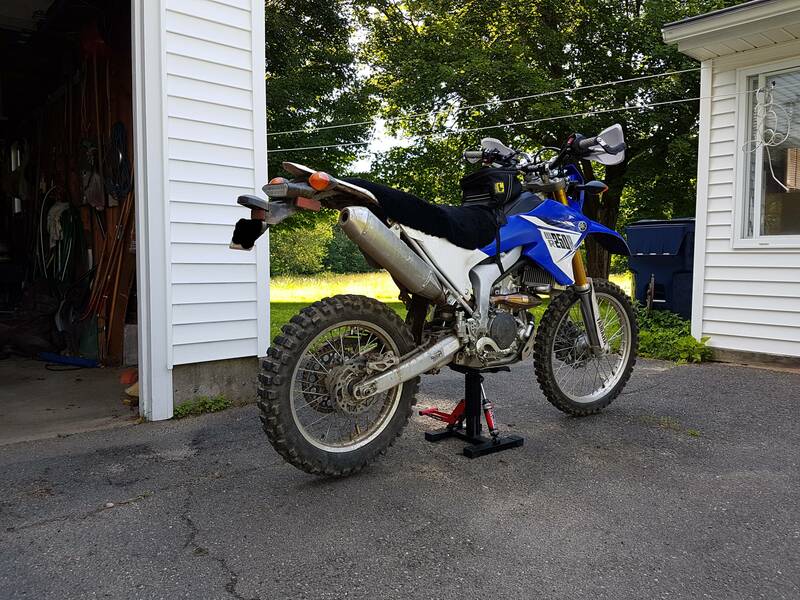 I was looking at local ads for low key(cheap) 230cc trail bikes and came across a few Husqvarna WR125 2 stroke bikes that don't stretch my budget too much at just under $2k. One that peaks my interest is asking $1900, has new tires and brakes, fmf silencer, 144cc factory head, and a re-valve from a local shop. Heres a picture. 2 stroke engines are not foreign to mean but not sure what they mean by a re-valve. What can I expect for maintenance on these? I also understand the seat is quite tall. My WRR is 1.5 inch lower and I am halfway between flat foot and toes. I hear the Husky WR125 is a great woods bike, but not sure if it's acceptable for my skill level. If not, I'll just look for TTR230's or CRF230's to start on. Re-valve of suspension. Great bikes, parts are still available and cafehusky is a great source of info. I had a 2011 CR, miss that bike. Get the Husky, the other bikes you mention are tanks and will bore you eventually more than likely. You will get used to the seat height and learn the power, etc. of the WR. Oh the suspension right. I tried joining cafe husky but my account is still awaiting admin approval to post. It seems like a lot of bike for the money. I believe the appropriate response here is "shut up and take my money!" I'd be ALL over that husky. They are tall. You arent. I had a semi local dealer selling new last year 125 huskys for 3500$. Used they should be cheap. The few here I see online sit forever. Horrible resale value. If you aren't aware what you are looking at is an Italian husqvarna. They are out of business. The newer ones are ktms. Yea I knew the italians stopped in 2014, wasnt sure exactly what the deal was. Apparently there are still some dealers with parts. Yes, Bills MC Plus in Salem Oregon or Hall's Husqvarna in the midwest somewhere. The CR/WR125 is essentially an issue free bike. Their red head 250/310F all had various issues with valves and/or starters or ignitions. I had a 2014 WR300. Great bike other than trying to start it - impossible and crappy ignition too IMO. The 125 is the one to get from this manufacturer (Cagiva). THe 2009+ models were stuffed into a great handling frame! Other Italian built Huqvarna to consider was either the 450 or 510 but NOT NOT NOT the 449 or 511 (BMW designed with the CTS drive system that sucked and failed and broke all the time) but those are all far beyond your needs at this point.